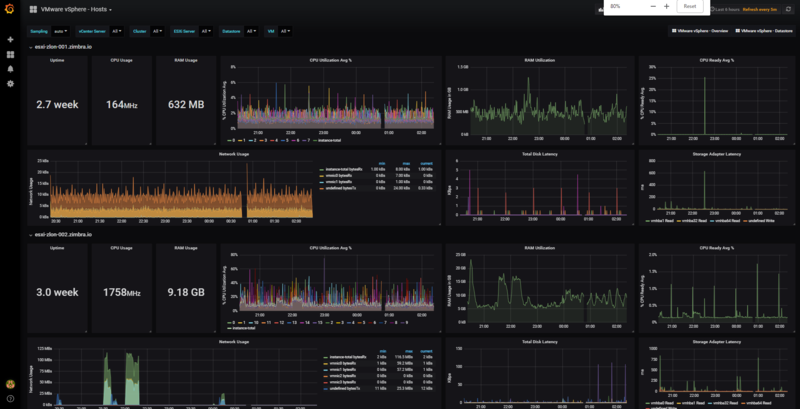 This dashboard contains two different sections, one to monitor the ESXi and vCenter Performance, and another one for Virtual Machines Performance. The Dashboard has variables to make it easier to use, and more suitable for all different workloads out there. The guages are configured automatically as well to the Datastores you select, in case you have so many, consider to change the Min Width on the Repeat Panel. ## and edited for the plugin to work. # datacenter_metric_exclude = [ "*" ] ## Datacenters are not collected by default.